This interactive adventure introduces children ages 3 to 6 to the world of computers while teaching them logic, organization and memory skills. Little Bo Peep has lost her sheep; the cat's lost his fiddle; there's lots of trouble in Mother Goose Land and it's up to you to help out. The child reunites 18 delightful animated characters with their lost items. In return, each character performs a song complete with animation and text. Learning the classic nursery rhymes has never been so easy and fun! Mixed-Up Mother Goose (SCI), designed by Roberta Williams, became one of the best-loved children's software titles of all time. The child can pick from several characters to find the one that most resembles him or herself and the game uses a simple child-friendly interface. Originally the game was made in 1987, using Sierra's AGI engine. It was then remade in 1990 with Sierra's SCI0 engine, featuring higher resolution and soundcard support, but still EGA graphics. This VGA remake is the third and most extensive remake of the game. 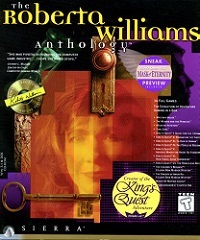 Not only does it feature brand new VGA graphics, but also a new interface, and the rhymes were given voices, each of them being sung separately. Also an in-game map of the land was added, if the player should ever feel lost in the nursery rhyme world. The VGA release was made both for floppy and multimedia CD-ROM. The floppy and CD-ROM versions are not completely identical, with the main difference being that CD version features full digital speech, whereas the floppy version only the rhymes were digitally recorded. 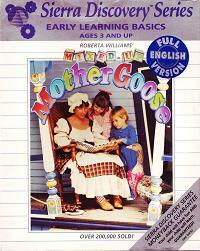 Finally in 1995 it was again remade as Mixed-Up Mother Goose Deluxe, featuring SVGA graphics.